After Dawn of War 2's brief venture into small unit tactics the large armies are back. Dawn of War 3 sets unit limit much higher than the previous incarnation. For the Space Marines, the unit limit is 200. Which in a way makes sense. Since Codex Astartes-compliant chapters have 1000 Space Marines at best, deploying even 200 of them is already a strong commitment. And usually also an overkill.It is unclear yet whether the limit is persistent across two other factions, the Eldar and Orks, or maybe there are changes. It would certainly be appropriate to have huge armies when it comes to the Orks. The increased unit-count isn't the only way the scale was increased. The other is the inclusion of massive units like Imperial Knights and Wraithlords. They will have a powerful presence on the battlefield, towering over every other unit and effortlessly wiping them from the face of the planet. The sad, but definitely understandable part is that we won't be able to spam them on the battlefield because they'll be tied to the second feature of DoW3, discussed further down. To make sure that no information drowns under the flurry of lasers, plasma, explosions and swarming enemies, the developers redesigned the visual effects from the ground up. They graded each of them in terms of importance as feedback or even dramatic value (orbital cannon is a turning point for any confrontation) and adjusted their visuals accordingly. It's not only the first Dawn of War's features that return. 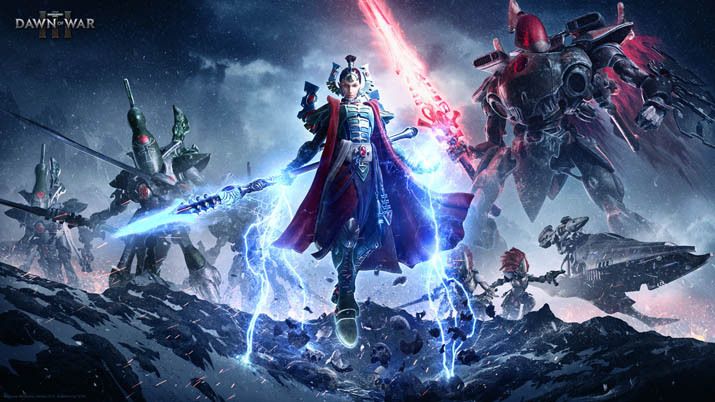 The hero units known from Dawn of War 2 also mark their glorious comeback, albeit in a slightly different capacity, less reminiscent of an action RPG. This time they will have fixed abilities and equipment, as well as enough personal power to come back unscathed from fighting entire squads of enemies. They aren't going to win any battles for you, but when deployed they will be a solid backbone of your army. Each faction will have several of them, representing different specialties and types of units. For instance the Space Marines will have a support-centric Librarian Jonah Orion, but also a towering Imperial Knight Solaria, a massive mechanical walker piloted by a noble. So how *are* the Elites deployed? While in the singleplayer campaign their presence will most likely be determined by the plot, in multiplayer the situation changes. First of all: you will only be able to pick three Elites for any given battle. No Elite spamming for you. They won't come for free, either. Each Elite unit will have a predefined cost you have to pay to summon them on the battlefield. This is where Elite points come in. To represent their unique status for the army, Elites won't use your usual resources and energy. Instead they'll have a resource of their own, which will be very slowly growing throughout the match. It will be possible to gather them faster by destroying certain structures, for instance, or capturing a related strategic point. The more powerful the unit, the higher the cost, which introduces an additional layer of strategy to the battle. Deciding whether to deploy a low- or mid-level Elite as soon as you can, or to deploy an army-crusher later on will be a vital part of engagements. WH40k: Dawn of War 3 marks the return of Blood Ravens, old friends from the previous Dawn of War games (and their cameo in Relic's Space Marine). They have apparently recuperated from their troubles in previous games, and are back to full fighting force. Why are they at war this time? As for the Orks? Well, they want to get a pointy stick from the puny pointy-eared Eldar and have some fun war...pardon, WAAAAAAAAAAAAAGH as a bonus. Curiously enough, this time the campaign will not focus solely on the one of the warring factions. From mission to mission the perspective will shift, allowing the player to see the conflict from all three sides. If Dawn of War 2: Retribution is any indication, the Orks' will be the most fun. 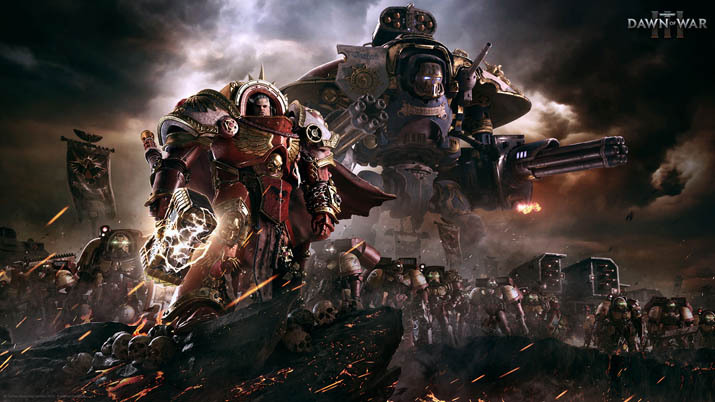 Dawn of War 3 is definitely something to wait for, especially if you are a Warhammer 40k fan. Larger scale, fun Elite units and probably appropriately twisted and convoluted storyline are all very promising. Although, as is customary these days, Dawn of War 3 preorder version contains some unique content, it isn't anything gameplay-breaking: just several skins for the mecha units. Pre-order bonuses that do nothing to harm game balance are always welcome. Warhammer 40.000: Dawn of War 3 launches a new crusade on April 27, 2017. Will you join the WAAAAAAGH, fight for the Craftworld, or maybe choose to trust not the alien, the mutant, the heretic and win for the Emperor?